It was a busy weekend around here with as much family time as we could pack in. I did stitch a few more 4 patches though. 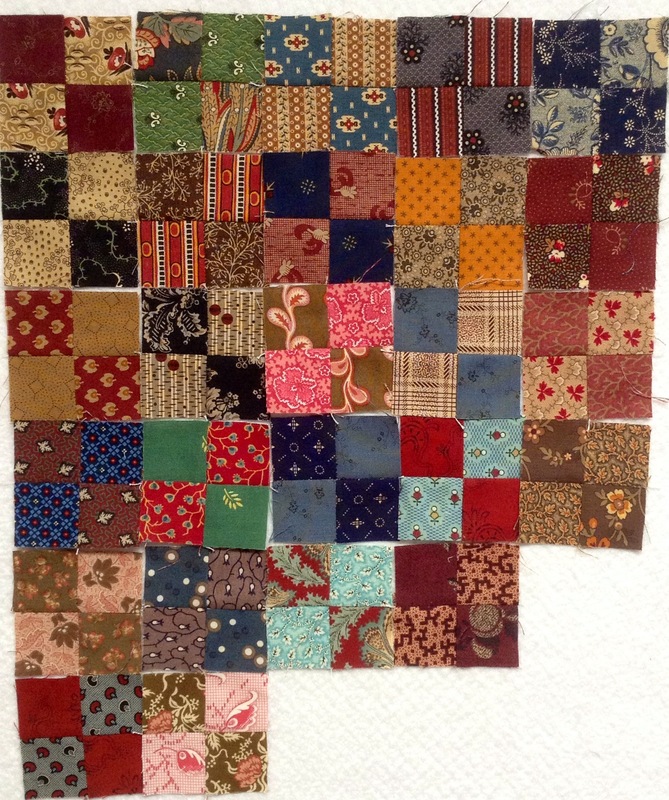 And I am happy to share with you that Kathie at Inspired by Antique Quilts has written a post about the quilt she made that inspired mine. You can see it here. I also finished my pumpkin seed blocks this weekend (cue the Hallelujah chorus)! These will be set aside for a while. 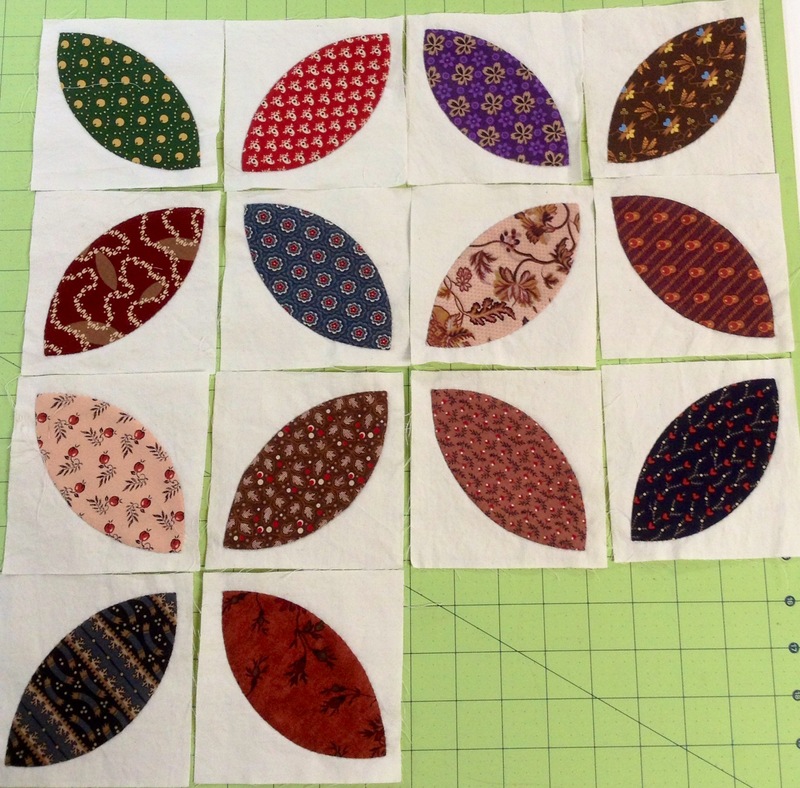 I intend to use them in a medallion quilt at some point. Said medallion quilt has not been designed yet! I just know that once I start, I am not going to want to take a 3 month break to appliqué blocks! 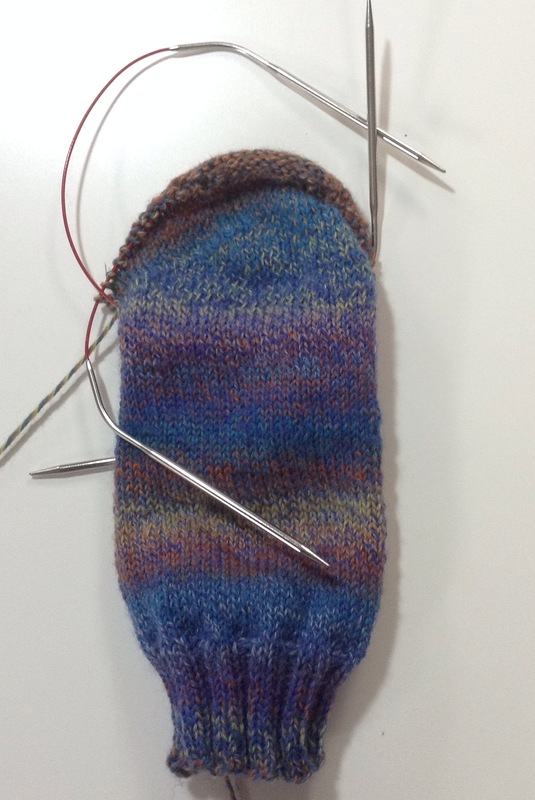 I got half the heel done. I am a very slow knitter. And once I start feeling it in my wrist. I quit working. I hope to get this pair done by Christmas! Linking up with Judy Patchwork Times for DWM and Marelize at Stitch by Stitch for Anything Goes Monday. This entry was posted in Civil War Repro Quilts, Design Wall Monday, Knitting, Socks. Bookmark the permalink. Love your pumpkin seeds – gorgeous fabrics! I can’t wait to see what you do with them. A medallion quilt sounds fabulous … maybe because I’ve been dreaming about making one myself … so I’ll be following your progress with interest! Love your pumpkin seeds and can’t wait to see what you are going to do with them. I’ve been making my own for a few years now with no idea what to use them for. Hoping your design will inspire me. I must have 100 by now. The sock yarn you are using is yummy! The pumpkin seed blocks look great. Congratulations on finishing yours. Looks like you got a lot done to me. Are you a public librarian or school or ??? You’ve been busy. I love your fabrics.